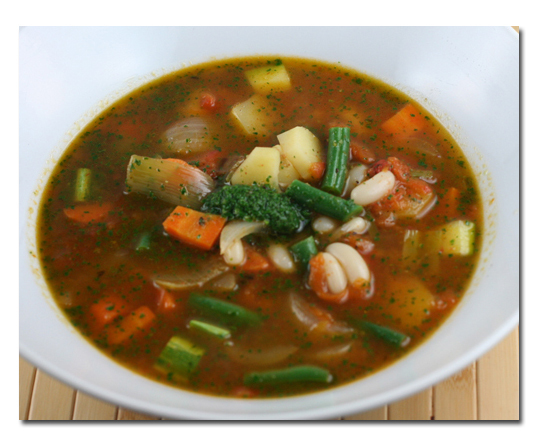 Pistou soup is often thought of as the French Provencal vegetable soup. This soup is low on calories and high on fiber. Ingredients for our version of Pistou allow for several subsitutions and omissions depending on your taste and what is available. If you are using dried beans soak them overnight in 3 quarts of cold water. Drain the beans and put them into a pan with 2 quarts of fresh cold water. Add the bouquet garni and let the ingredients simmer. Skim off any foam that may appear. Cook for about 1 hour but test for doneness. If you have fresh white beans they do not need be soaked and the cooking time should be only about 20 minutes. After the beans have finished keep them in a warm bowl. Dice the carrots, leeks, onion and and celery in 1/2" dice. Sweat them with a tablespoon of olive oil for a few minutes, but do not allow to brown. After a few minutes add the six cups of stock or water. Cook for 15 minutes. For the potatoes, green beans, zuchini and turnips. Dice all the vegetables into 1/2 dice. Cook the potatoes in salted water until almost tender then add the turnips for a few more minutes. Cook the green beans in an open pot with salted water and refresh with cold water if you wish to retain the green color. 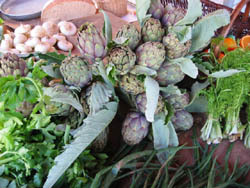 Pistou Sauce: Prepare according to our Greenmarket Pistou Recipe the a basic basil sauce. Take half the basil sauce and blend in the tomatoes. Reserve the rest of the pistou for garnishing each plate. Mix all the ingredients together and cook for 5 minutes. Before serving remove the bouquet garni and stir in the 1/2 portion of pistou sauce which contains the tomatoes. This should be done off the flame. 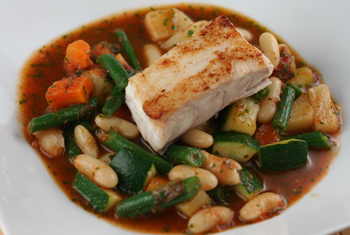 Use the remaining pistou sauce to garnish each dish as shown in the photo above. Sprinkle some parmesan cheese on top of each dish. Serve with bread. Do not add the pistou till the last minute. 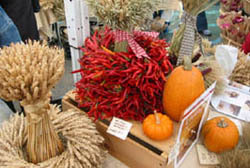 The hot soup will cook the pistou and allow the aromas of garlic and basil to fill the room. Celery is necessary in this recipe to add flavor to the stock as the turnips. These need not be added to the final dish. I use the celery, carrots, leek, onion and bouquet garni to provide for the starting broth since I prefer using water instead of any stock when the vegetables are intense in flavor. If you are not a vegetarian try this dish adding some smoked ham or bacon during cooking. 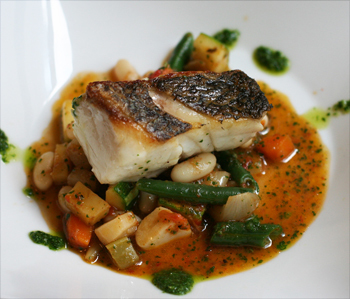 Wild Striped Bass with Pistou ... a crispy skin adds another flavor to the dish.